So said the pseudonymous “Frank Danby” in a 1912 article in an English periodical. 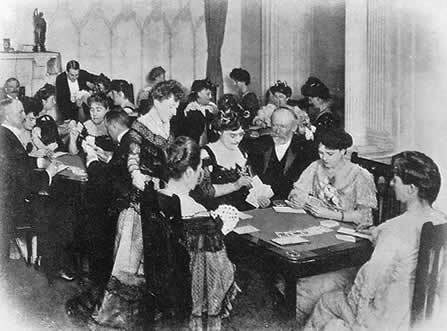 By the time this article was published, the mania for bridge had become a major source of entertainment for society on both sides of the Atlantic, though nowhere else did this card game become a point of obsession than deep within the heart of Mayfair. In a previous article, I discussed the emergence and growth of ladies’ clubs. Though they claimed to be patterned after the historic gentlemen’s clubs dotting Pall Mall, many in the beginning were places for ladies to rest and unwind between bouts of shopping or visiting Town, or for ladies of certain social or education sets to reconnect. With the advent of bridge, ladies clubs began to fall in line with their famous counterparts (White’s, Boodles, Marlborough) as places where women convened to gossip, drink tea and cocktails, gamble, and get away from men. More than a century before Roger Federer and Andre Agassi faced off in the U.S Open tennis finals in New York, players were donning fancier attire and taking to the courts of Newport to compete in championship matches. 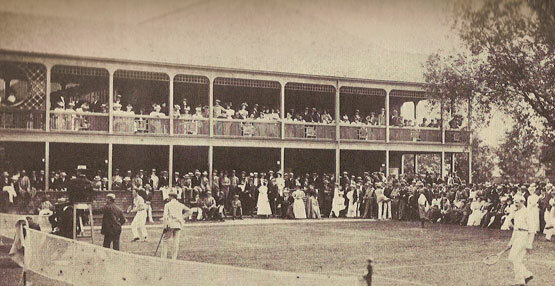 The earliest incarnation of the tournament, then known as the U.S. National Championships, began in Newport in 1881. Players competed on grass courts while musicians performed classical music in a decidedly genteel setting. Smoking in the nineteenth century underwent many amusing changes, per the advice of etiquette books. Guides to modern behavior once stressed how vulgar it was to smoke, but when ladies took up the habit, it behooved these arbiters of social instruction to catch up with the times. If you are so unfortunate as to have contracted the low habit of smoking, be careful to practise it under certain restrictions; at least, so long as you are desirous of being considered fit for civilized society. The first mark of a gentleman is a sensitive regard for the feelings of others; therefore, smoke where it is least likely to prove personally offensive by making your clothes smell; then wash your mouth, and brush your teeth. What man of delicacy could presume to address a lady with his breath smelling of onions ? Yet tobacco is equally odious. The tobacco smoker, in public, is the most selfish animal imaginable; he perseveres in contaminating the pure and fragrant air, careless whom he annoys, and is but the fitting inmate of a tavern. All songs that you may see written in praise of smoking in magazines or newspapers, or hear sung upon the stage, are puffs, paid for by the proprietors of cigar divans and tobacco shops, to make their trade popular, — therefore, never believe nor be deluded by them. The pipe […] is a powerful rival to wife or maid, and no wonder that at last the woman succumbs, consents, and rather than lose her lord or master, even supplies the hated herb with her own fair hands. And this is what women have come to do on the Continent; but in America they have gone further, and admitted the rival to their very drawing-rooms, where the unmanly husband stretches his legs on the sofa, smokes, and spits on the carpet. Far be it from our English women to permit such habits; and yet, as things are, a little concession is prudent. One must never smoke, nor even ask to smoke, in the company of the fair. If they know that in a few minutes you will be running off to your cigar, the fair will do well—say it is in a garden, or so—to allow you to bring it out and smoke it there. One must never smoke, again, in the streets; that is, in daylight. One must never smoke in a public place, where ladies aro or might be, for instance, a flower-show or promenade. One may smoke in a railway-carriage in spite of by-laws, if one has first obtained the consent of every one present; but if there be a lady there, though she give her consent, smoke not. In nine cases out of ten, she will give it from good-nature. 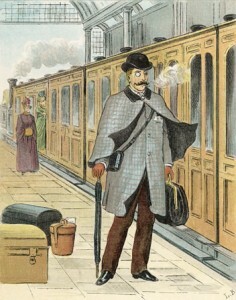 One must never smoke in a close carriage; one may ask and obtain leave to smoke when returning from a picnic or expedition in an open carriage. One must never smoke in a theatre, on a race-course, nor in church. This last is not, perhaps a needless caution. In the Belgian churches you see a placard announcing, ” Ici on ne mache pas du tabac.” One must never smoke when anybody shows an objection to it. One must never smoke a pipe in the streets; one must never smoke at all in the coffee-room of a hotel. One must never smoke, without consent, in the presence of a clergyman, and one must never offer a cigar to any ecclesiastic over the rank of cm ate. But if you smoke, or if you are in the company of smokers, and are to wear your clothes in the presence of ladies afterwards, you must change them to smoke in. A host who asks you to smoke, will generally offer you an old coat for the purpose. You must also, after smoking, rinse the mouth well out, and, if possible, brush the teeth. You should never smoke in another person’s house without leave, and you should not ask leave to do so, if there are ladies in the house. When you are going to smoke a cigar yourself, you should offer one at the same time to anybody present, if not a clergyman or a very old man. You should always smoke a cigar given to you, whether good or had, and never make any remarks on its quality. The practise of smoking should be exercised with much discretion in public or private. As a rule it is offensive to ladies in this country no matter how much they may disclaim the fact. It would be a proper course and a respect to ladies for a gentleman not to smoke while in their society. It is customary in some houses for gentlemen to smoke at the close of dinner, but this should only be after the ladies have retired from the table. 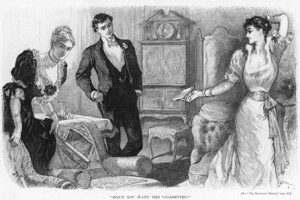 Sometimes the gentlemen are invited into another apartment for smoking, and rejoin the ladies in the drawing-room after they have disposed of their cigars. It is at all times inelegant to be puffing away at a cigar while walking with a lady on the street or engaging her in conversation. Smoking a pipe in public is not only inelegant but is offensive to most people. The etiquette in this, as in many other matters, has quite altered during the last few years. At one time it was considered a sign of infamously bad taste to smoke in the presence of women in any circumstances. But it is now no longer so. So many women smoke themselves, that in some houses even the drawing-room is thrown open to Princess Nicotine. The example of the Prince of Wales has been largely instrumental in sweeping away the old restrictions. He smokes almost incessantly…It is now no uncommon thing to see a man in evening dress smoking in a brougham with a lady on their way to opera, theatre, or dinner engagement. The modification of old-fashioned rules in this regard has made the lines faint, it is true, and there is no book on etiquette that does not reprehend as “unbecoming a gentleman” smoking in drawing-rooms, boudoirs, dining-rooms, restaurants, where now men not only are allowed, and invited, to smoke, but where highly respectable women have been known to join them. Gentlemen in this country do smoke, when at home, in the drawing-room and dining-room j there is no doubt about that; that is, when the women of the family do not object. Most women have a decided objection to bedroom smoking; and it is not a wise practice, on any account, to use up the freshness of bedroom air. But putting aside old-fashioned prejudices, and out-of-date “notions” as many sensible dislikes of women are called—a man should never smoke anywhere, without first assuring himself that it is not disagreeable to the ladies in the room, and in the house. A gentleman paying an afternoon visit should not smoke unless others begin; and even then it should be some one in authority, and not a younger brother, for instance, or a “cheeky” caller who leads him on. He should never smoke before the ladies have left the dining-room, except in unusual instances; he should not smoke when any one—with a real voice—is singing, for tobacco smoke is death to vocal success and causes great discomfort to singers, whose throats, being highly trained, are proverbially sensitive. The etiquette of smoking among women has not reached the stage when it permits the habit to be publicly indulged. Women are obliged to smoke in corners, when they are at clubs or races. How long this state of things will continue it is impossible to say. At the present rate of progress, women and young girls will be smoking in the streets with men. It is a horror and a crying shame; for the debasing character of the custom will inevitably destroy the delicacy of women. When walking on the street with a lady. When lifting his hat or bowing. In a room, an office, or an elevator, when a lady enters. In any short conversation where he is standing near, or talking with a lady. If he is seated himself for a conversation with a lady on a veranda, in an hotel, in a private house, anywhere where “smoking is permitted,” he first asks, “Do you mind if I smoke?” And if she replies, “Not at all” or “Do, by all means,” it is then proper for him to do so. He should, however, take his cigar, pipe, or cigarette, out of his mouth while he is speaking. One who is very adroit can say a word or two without an unpleasant grimace, but one should not talk with one’s mouth either full of food or barricaded with tobacco. 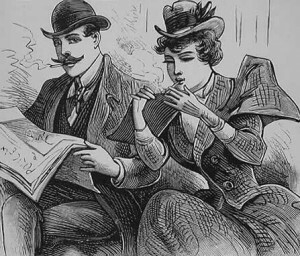 In the country, a gentleman may walk with a lady and smoke at the same time—especially a pipe or cigarette. Why a cigar is less admissible is hard to determine, unless a pipe somehow belongs to the country. 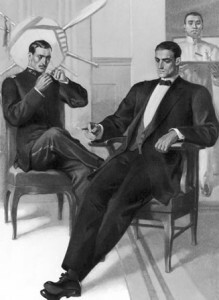 A gentleman in golf or country clothes with a pipe in his mouth and a dog at his heels suggests a picture fitting to the scene; while a cigar seems as out of place as a cutaway coat. A pipe on the street in a city, on the other hand, is less appropriate than a cigar in the country. In any event he will, of course, ask his companion’s permission to smoke.